Two Mormon missionaries ring Ethel Merman's doorbell and hilarity ensues. It's a diva driven journey of self-discovery with an original score of comedy songs, power ballads and mash-up standards. "...The Book of Merman is produced by Flying Elephant Productions, whose artistic director, DC Cathro, is also the author of the show's book and the director of this inoffensive little effort. The actors in the three-person cast-Nicole Frydman as Ethel, Michael Idalski as Braithwaite, and Samuel Aquilla Massey as Shumway-are talented and game. They would have benefited from working with a director who would challenge the material rather than indulge it"
"...Nicole Frydman makes a fine Ethel Merman and Michael Idalski and Sam Massey are more than up for their roles as Mormon missionaries. There is a lot to like in Leo Schwartz�s music and lyrics. The laughs, though, are too few and far between for this production to ever truly take off. Those expecting anything close to the comedic genius of the better-known Mormon-centered musical will almost certainly walk away disappointed. There seems to be only so much you can do with the premise of Ethel Merman meeting up with a couple of Mormons." "...Featuring a tuneful array of songs that parody both �Book of Mormon� and almost every Ethel Merman classic, such as �Annie Get Your Gun,� �Gypsy� and �Anything Goes,� Leo Schwartz�s exuberant new musical parody is lively and lighthearted. Throughout all the clever songs and dance moves, the message that theatergoers will take with them is how important it is to simply be yourself and to appreciate others for who they are. Directed and performed with pizzazz and polish by co-book writer, DC Cathro, this entertaining show will appeal especially to Broadway musical aficionados, as well as to audiences looking for a bright, breezy, feel-good show to warm up Chicago�s winter evenings." "...The Book of Merman has to be one of those creative endeavors that started with its title. 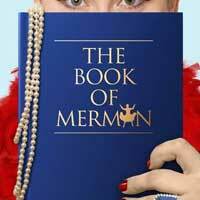 A parody of The Book of Mormon in which two missionaries knock on the door of Ethel Merman? We�re talking high-concept heaven. With the right cast and creative team, this thing is a guaranteed hit, right? Well, Flying Elephant productions has put together the right team and cast, and its current revival of The Book of Merman (which enjoyed a 2015 run from Pride Films and Plays and is currently running off-Broadway) is simply wonderful."